The country school which grew from a small one-room house to an educational plant of considerable size was an important entity in the plantation community. Hakalau School, in addition to its function of teaching the three R's, also became the district's center for many social and athletic activities until it was closed and consolidated with Kalanianaole School in Papaikou in 1972. About 1864, the first school in Hakalau was started in a house that was located not on its present site, but down on an island in the Hakalau Gulch. It would have been above the abandoned Hakalau Sugar Mill site. According to some reports, the teacher was Mr. Kalawaia who taught nineteen students. The last teacher there was Mrs. P.B. Macy. The school was moved across the gulch on the Kamae side, probably because the teacher of the boys and girls got tired of having to swim across to school often, for there were many rainy days and the gulches were often flooded. So on September 30, 1882, King Kalakaua of the Hawaiian Kingdom signed a document authorizing the issuance of patent for school lands and school sites to the Board of Education. Hakalau School was included in this royal document, with the land in the present school site. 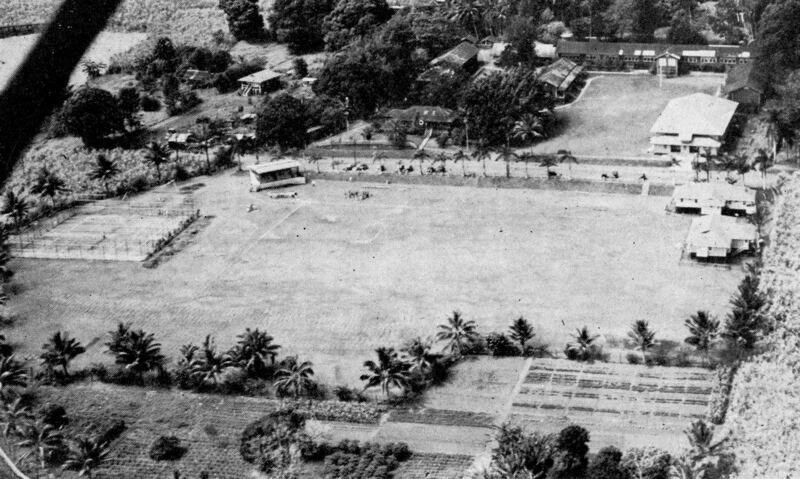 1941 Young Buddhists Association Softball Tournament at the Hakalau School Park. Source: Waichi Ouye Collection, courtesy of his family. The residents and former students celebrated the centennial.